Darkest Dungeon isn’t exactly new news at this point. The game was originally Kickstarted for the PC back in February of 2014, and it entered a long period of Early Access at the beginning of 2015 that would see the core game improved, refined, and expanded until its full retail release roughly a year later. During that long period, many players spent dozens to hundreds of hours with the game, and have enjoyed content infusions along the way which have kept the formula fresh. A host of different creatures inhabit 5 distinct environments, and learning how to best handle them is a major undertaking. That fully-fledged product is what Vita and PS4 owners now have access to for the first time. If you haven’t given the game a shot yet, allow me to tell you the many reasons you should, and perhaps the rather few you maybe shouldn’t. 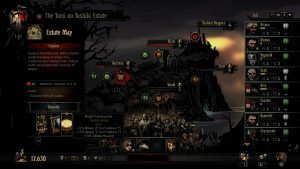 At its heart, Darkest Dungeon is a single-player, turn-based, squad-oriented tactical combat game, but it’s a difficult title to conveniently squeeze into categorical boxes (even with gratuitous overuse of hyphens). It blends elements from a variety of genres into a unique, compelling package, and while it likely appeals most strongly to a fairly concrete demographic, there’s really nothing else out there quite like it. Players take control of a nameless heir to a great estate that has fallen into a frightening state of disrepair. The sad tale of the manor and surrounding town is delivered by the heir’s ancestor at the outset of the game via a posthumous letter begging the player to claim their birthright. This narration turns out to be a core element as things progress, as the Ancestor punctuates dungeon encounters with a host of Lovecraftian one-liners, and slowly unveils the mysteries of the estate and its gradual collapse as bosses are defeated. It’s worth special note here that not only is the writing exceptional, mimicking Lovecraft in the most perfectly gleeful manner, but the voice of the Ancestor, provided by veteran voice actor Wayne June, is one of the most stirring, evocative, and memorable performances of the industry’s last decade or two. Good voice acting isn’t hard to find, nor is a solid script, but such an exceptional marriage of theme, writing, and performance is a rare treasure indeed. The Estate is a big place, and will offer diligent players many hours of perverse thrills. The Ancestor isn’t the only one doing the talking, however. As the player recruits a small army of mercenaries from those who show up in town looking for work, the game’s primary focus becomes apparent: the heroes themselves. They only speak in text bubbles, but they have quite a lot to say about the dismal world around them, and there’s as much weighty reflection as there is heroic posturing and good humor. Why is this important? Because the heroes of Darkest Dungeon are complex, flawed people by design. Their quips and observations are just a small part of a network of systems designed to make them simultaneously more and less than the average video game heroes. As they adventure, there are the usual RPG considerations: heroes need to be outfitted with gear, trained up to higher tiers of ability, and healed of their physical wounds. But in Darkest Dungeon, the most immediate threat generally isn’t death. It’s sanity. In addition to a standard health bar, every hero has a sanity meter. While any hero’s health bar will automatically reset upon returning to town from a trip into the dark, their sanity meter does not. 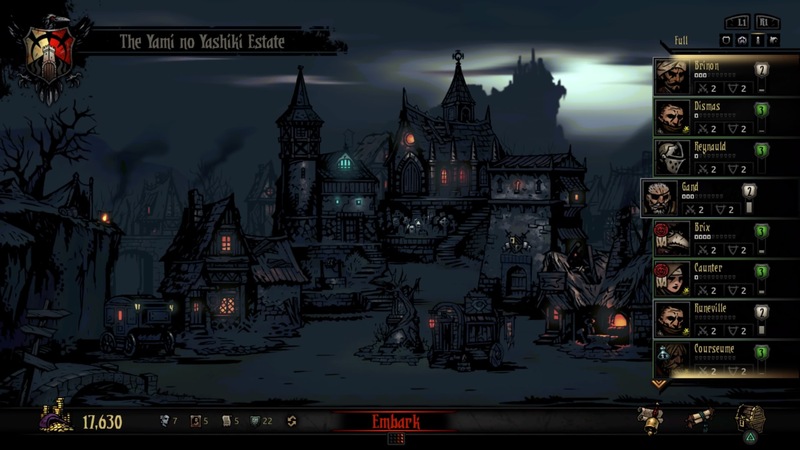 Sanity can be “healed” using a variety of character skills, and also using several different facilities in town, including a lively tavern (with attached brothel) and an abbey. Heroes travel to the dungeons in groups of 4, and will invariably exit said dungeons in varying states of mental disrepair. Some will come out reasonably unscathed, but others will need to take a breather between missions by drinking and gambling at the tavern or praying and meditating at the abbey. This management aspect is at the core of Darkest Dungeon’s gameplay loop. New heroes show up at the hamlet looking for work, the player can hire the ones he or she sees fit, and then as the new recruits delve into the sinister depths to battle Lovecraftian nightmares, players are expected to deal with a host of varied complications. Too much stress during a dungeon run results in a semi-permanent state of affliction which will cause characters to act illogically, impulsively, or abusively, often adding even more stress to themselves or their companions. Heroes are also susceptible to a host of diseases as they travel, which will cause them ongoing debuffs until the illness is dealt with. Positive and negative quirks occur as they level up, which have a huge array of different potential effects, from situational buffs and debuffs to outright behavioral inconsistencies (such as stealing loot for themselves or fiddling around with occult devices they should probably leave alone). Heroes are sponges for negative effects, and learning to manage these is part of what the game expects of players. It’s a lot to deal with, and while it runs the risk of making the game a micromanagement nightmare, the balance between character maintenance and dungeon-diving is nearly perfect. Just when you can’t stand the thought of figuring out who else needs to be cured of debilitating emotional problems or insidious disease, you find yourself back in a dungeon smacking monsters around. The game will always present new problems and new challenges, but smart use of time and resources will ensure that you’re also constantly solving older ones, either through fixing up your best heroes or retiring those who, perhaps, would be better off never visiting a dungeon again. Quests of varying types, lengths, and difficulties are selected in town from a constantly shifting assortment, and heroes are then outfitted with gear and supplies before setting off. Inventory space and money are limited, however, so buying the right supplies for the job is a major concern, and buying either too much or not enough can have problematic consequences. If you over-prepare, you’ll waste money on supplies you didn’t need, not to mention cluttering your inventory and making it harder to carry loot back to town. But bring too little, and your characters run the risk of starving or not having enough torches to light their way. Interestingly, the game ties difficulty and reward to the level of current torchlight. Monsters and sanity loss get tougher as the light wanes, but potential rewards increase, leading to a wonderful risk-reward system that ties resource and inventory management directly to combat. Dungeon exploration ties these things together too. Layouts are procedurally generated, though dungeons always consist of simple room-and-hallway constructions. Hallways are littered with monsters, traps, and “curios” (interactive objects that contain loot or bestow effects on heroes). Rooms may contain larger treasure caches or groups of monsters, and are often the targets of quest objectives. Dungeon trips consequently go best when the player has a good strategy for approaching quest goals, dealing with obstacles, and using resources to keep heroes fresh in combat (and hopefully reasonably sane). Combat is a turn-based, tactical affair that involves good skill selection, team composition, and a lot of focus on positioning. Enemies and heroes line up on either side of the screen, and their position in line determines what skills they’re able to use (and which positions on the opposing side they’re able to affect). It’s a novel take on combat that takes familiar concepts and uses them in new ways, and while it does heavily involve dice rolls, it’s not “random”. 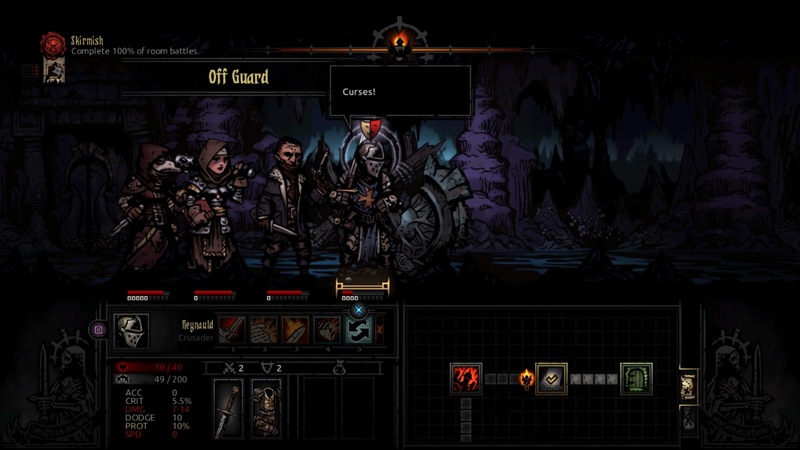 In fact, combat in Darkest Dungeon asks players to do what the rest of the game does (quite literally): make the best of bad situations. Winning isn’t about steamrolling the enemy, it’s about learning how to minimize risk. Save scumming isn’t an option, as the game saves constantly, and thus the unpleasant effects heroes may suffer can’t be whisked away by a quick press of a button. If your favorite crusader comes down with a wasting disease, or if your healer loses her marbles and starts passing turns of her own accord, those are realities you’ll have to live with. Likewise in regards to hero mortality; when they die, they stay dead, and you’ll have to decide whether to press on or retreat, in addition to dealing with the physical and mental scars of the survivors. You’ll want there to be at least one survivor, because if nobody escapes, nobody brings back the scavenged gold for your coffers. Darkest Dungeon never drops you into an unplayable hole from which there is no escape, but if you play poorly enough, you can certainly end up in positions where you’ll need to climb. The town offers upgrades for heroes in addition to helping them manage their stress (and bulk out their roster). 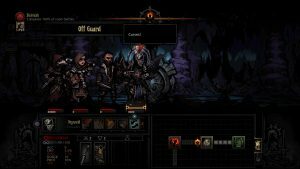 And this is the largest caveat when it comes to recommending Darkest Dungeon: it’s hard. How hard? That depends largely on how well you learn its mechanics. If you read some reviews and forum posts, you might be inclined to think that the game is so unfair as to be completely impossible, but this is patently false. Darkest Dungeon simply asks you to do what many games no longer do—learn its systems. Observant players who choose to invest in the game will find their efforts rewarded, and those who can’t (or choose not to) will find themselves barely scraping by. 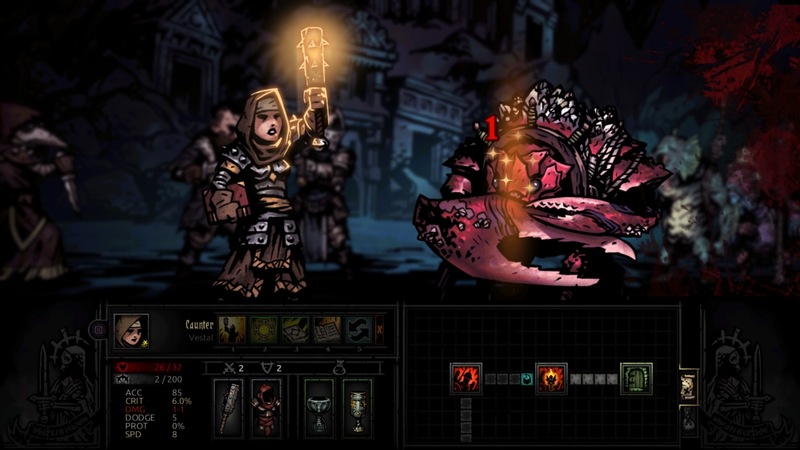 It’s never an easy game, especially if you’re savvy or lucky enough to make it to the very end (the titular darkest dungeon is a harrowing run even for capable vets, and a soul-crushing nightmare for the unprepared), but success is entirely possible if one learns to properly manage probabilities. Those who can keep up with the logistical challenge are in for a real treat. Tight combat, a rewarding gameplay loop, and stellar artwork make the experience a sumptuous one, decadent in its brutal subject matter and unforgiving nature. The PS4 and Vita controller interface is definitely less desirable than using a mouse, and could possibly be a little more elegant than it is, but a controller is still a viable way to play and doesn’t cause too much undue frustration. Both PlayStation versions of the game are cross-buy and cross-save as well, making the console release a tempting option. It’s a stellar fit on the Vita, as dungeon runs themselves don’t tend to take an extraordinarily long time, and playing multiple short sessions in a day works very well. Some things are slightly difficult to see and read on the smaller screen, but not enough to make it a major issue. A few early crash bugs have been patched out since launch as well, leaving both ports stable and smooth. If you haven’t yet taken the plunge on Darkest Dungeon, it’s well worth checking out, either in its classic PC format or one of its shiny new console ports. The oppressive atmosphere and difficult mechanics won’t be for everyone, but those who speak the game’s language will find that most titles rarely approach this level of balance and polish. Just be sure to bring enough torches. And maybe be careful about which dark corners you decide to stick them into. The Wait Is Over, The Final Evolutions Are Revealed! I played the recent PS4 release, and enjoyed it a fair bit. Perhaps my only major criticisms being that the level 5 (or 6? the ones with the highest level bosses) dungeons seemed way too RNG / Luck based, with 1 missed attack or 1 enemy crit being able to doom a character (or a whole party in some cases). And, oddly enough, the actual Darkest Dungeon, the final levels of the game, were far to easy, with the final boss being a bit too predictable, in terms of both form and function. I’m glad you mentioned Wayne June, one of the highlights for sure. Interesting. I don’t know if any balance changes have been made since I last played through the PC endgame, beyond making the climb back up a little easier if you happen to fail a few times (I’ve seen it literally break people on stream multiple times, so they added some features to make getting more people back up to level 6 less of a grind). I agree that the final boss is a bit of a disappointment, depending on what one is expecting; I’ve always taken it to be a case of not wanting such a long, difficult game to end with an overly ultimate challenge. As you say, the margin for error goes way, way down as you approach the end. I still don’t really think of it as RNG or luck so much as having to work to minimize certain very specific risks, but it’s pretty much semantics … the pendulum swings _real_ far in that direction, either way. But it’s still been one of my favorites this generation despite the few issues. Loved the Vita version, probably more then the PC version. For some reason it just seems to fit better. My only real complaint is it’s use of the rear touch pad, which has never worked on the Vita. I’d give anything for that functionality to be moved to the front screen instead. That didn’t bother me. I agree with you in general, but for this particular game I thought it was used somewhat decently. And the game really does fit well on the Vita. I had a blast with it. Wish I had more time to spend with it, as I have not done so to my satisfaction yet.